Brain Rules is a fascinating book that explores twelve simple principles to help us make the best use of our brains, enabling us to become better teachers, students, parents and business leaders. Find below a short review of the book, along with a mind map summary created by Litemind reader Johan D’Haeseleer. Exercise. Exercise boosts brain power. Survival. The human brain evolved, too. Wiring. Every brain is wired differently. Attention. We don’t pay attention to boring things. Short-term memory. Repeat to remember. Long-term memory. Remember to repeat. Sleep. Sleep well, think well. Stress. Stressed brains don’t learn the same way. Sensory integration. Stimulate more of the senses. Vision. Vision trumps all other senses. Gender. Male and female brains are different. Exploration. We are powerful and natural explorers. Although many of us may already intuitively know at least some of these principles, Dr. Medina explains the science behind each of them in a clear, accessible and often very funny manner, bringing along many entertaining stories and practical ideas we can use in classrooms, corporations or in any work environment. The principles are also explained in several, often hilariously funny short videos, to help reinforce each chapter’s concepts (the book ships with a companion DVD). The main idea of the book — which also serves as a big call for action — is that most of what’s in our world ignores these rules. As Dr. Medina points out, if you wanted to create an educational environment that was directly opposed to what the brain was good at doing, you would probably design something like a classroom. And the examples go on and on, from business presentations to office cubicles. The good news is that we have an incredible amount of room for improvement in practically everything we design, if only we would consider the brain rules when designing the world around us. Throughout the years, I gradually lost interest in reading ‘brain facts’ articles. Things like “Humans use only 10% or less of their brain“, or the idea that “listening to Mozart makes you smarter” being passed as scientific truths started to really annoy me. And that’s what I really like about Brain Rules: it’s based on real science. It’s backed up by peer-reviewed studies, often replicated many times. So when I say science, I mean it. And, surprisingly to many people, that doesn’t mean the book is boring, not by any means. In Dr. Medina own words, “I’m a nice guy, but a grumpy scientist.” Refreshing! 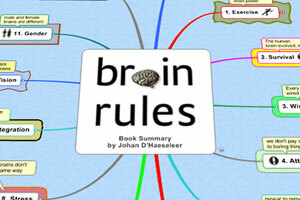 For ages I wanted to mention Brain Rules on the blog, but never got around to doing it. Reader Johan D’Haeseleer lent me a hand and generously sent a mind map he created, making up for my procrastination. 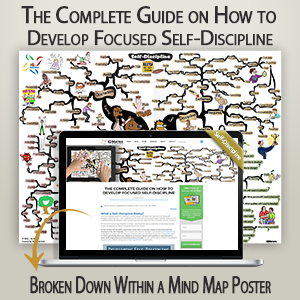 And here’s Johan’s mind map, which joins Litemind growing book summary gallery. Enjoy! Full version (1324 kb, requires MindManager). The online version, for download (62 kb, requires FreeMind). I would have included several links to Brain Rules materials and reviews, but the official Brain Rules website already acts as a great hub for all related information floating around. So, just head over there and browse around — there’s a blog, many videos, audio excerpts and much more to keep you entertained. If you like what you see, don’t forget to come back here and buy your copy.